Fall is here, and you know what that means! Colorful leaves, cool weather, amazing holidays, and much-needed time with friends and family. Make sure you are prepared where it matters this season: the dining room. Before you know it, Thanksgiving will be here, and you’ll want to make sure you have room for everyone. Hosting your first holiday this season? You’ll be an expert by the time you’re done reading our post! First: The foundation, the dining room table and chairs. Make sure there is room for everyone. 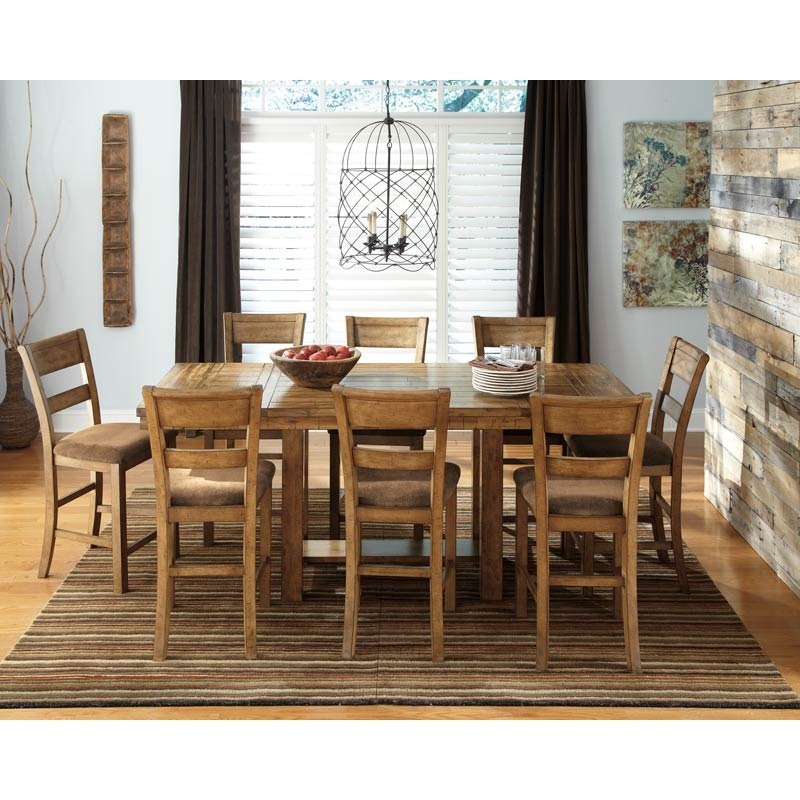 Our Ashley Krinden 9 Piece Rustic Counter Height Dining Set fits eight guests at one table, perfect for making memories that the whole family can be a part of. Need to squeeze a few more in? A bench is a great alternative to fit in more on one side of the room. Next: Don’t forget about storage. If you think you have a lot of guests, think about all the items that go into entertaining them! You’ll need a storage cabinet close by to house your dining ware, accessories, napkins, and silverware. We love our Trafalgar Square Server because it gives us everything we need: storage drawers, display cabinets, and a wine rack. Pulling it all together: Don’t forget to ground the room. Most, if not all, dining rooms have a lot of heavy, wooden pieces. Lighten the room with an area rug. Our design suggestion is to incorporate a rug that brings texture and warmth for the homey feel that the dining room is known for. Our Antiqua Green 8x10 Rug does just that. Everyone is different: Are you entertaining a smaller group of people? Dinner parties at the kitchen island are just as fun as a formal sit-down. One of the biggest benefits is that the chef (aka you—the host!) doesn’t have to miss out on any of the fun. So bring your guests into the kitchen! Our Seasons Kitchen Island is big enough for a group and has seating on each side. Your guests may even want to help the chef out! With our tips you are going to have the best holiday season yet! Weekends Only Furniture & Mattress is your go-to store for everything in your home in St. Louis or Indianapolis. From bedroom sets to everything for the office, we can help turn your house into a home. The store keeps prices low by spending the weekdays hunting for the best furniture for the living room, bedroom, home office, and dining room, and then opening the doors with big savings all weekend long.